Healthy eating for seniors is an important part of their overall health and well-being. Eating a well-balanced diet is critical as they age. Proper nutrition provides the necessary vitamins, minerals and other nutrients, and it can help maintain a healthy weight. Eating right can also lower the risk of developing chronic health conditions, such as heart disease and diabetes. Also keep in mind that as your parent, grandparent or other senior loved one gets older, their nutritional needs, diet and appetite may change. For example, they may need fewer calories because of a slower metabolism. They may experience a loss of appetite because their sense of taste and smell diminish. Or they may need to modify their diet due to a chronic health problem or because of a certain medication they are taking. 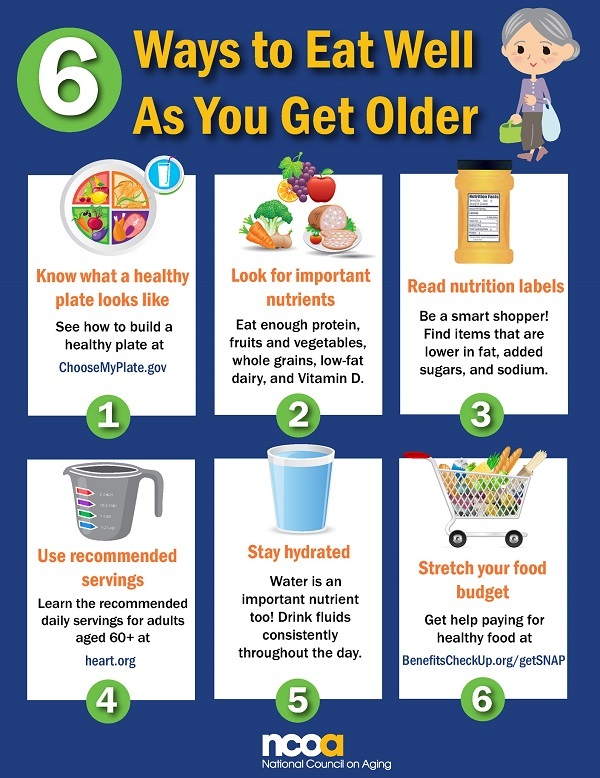 Check out the 6 Ways to Eat Well as You Get Older infographic for more advice. Here’s to proper nutrition and healthy eating for seniors!